Note: The IG04 BACnet Gateway has been superseded. 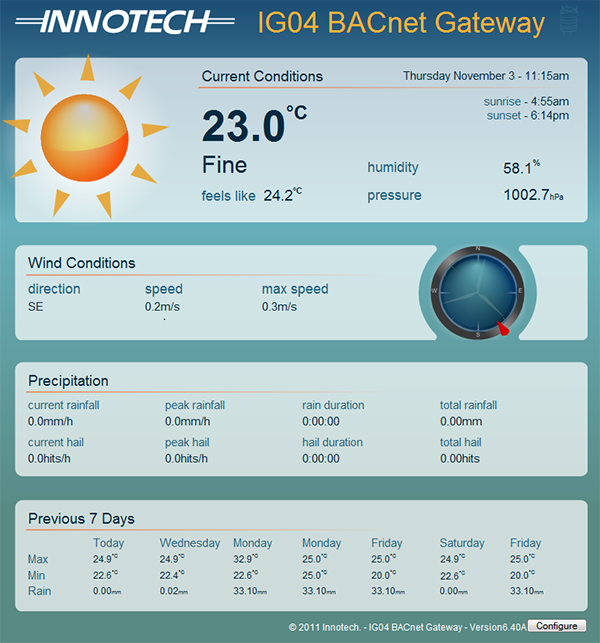 The Innotech IG04 BACnet Gateway is a protocol gateway between the Vaisala Weather Transmitter or Ultrasonic Wind Sensor and a BACnet network. The IG04 has the ability to program the weather transmitter without the need for additional software. The IG04 BACnet Gateway interrogates the Vaisala device and stores the current values for all NMEA points. This data is updated and transmitted regularly as predefined BACnet objects available as BACnet/IP or BACnet MS/TP values. No mapping or configuration tools are required to program the IG04 BACnet Gateway. Once the Vaisala transmitter is configured and connected to the IG04, they will commence communicating. The weather data can then be viewed directly from the embedded weather page on the IG04. The BACnet Objects are available for integration into your BMS project. The IG04 BACnet Gateway is a cost effective solution for Building Automation Systems required to monitor and analyse data transmitted from the Vaisala Weather Transmitter and into BACnet enabled devices. The IG04 BACnet Gateway communicates directly with the Vaisala Weather Transmitter by means of a dedicated RS-485 communications channel. A dedicated Ethernet Port provides access to BACnet/IP data and an embedded web-server interface. This web-server interface is used for commissioning and utilises HTML and a JAVA application called FusionLIVE. 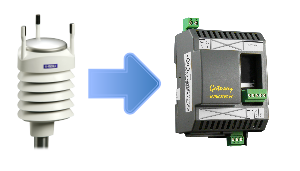 The IG04 BACnet Gateway provides seamless integration with the Weather Transmitter via automated creation of all BACnet Objects. No mapping or configuration tools are required to program the IG04 BACnet Gateway. Protocol converter allowing the integration of the Vaisala Weather Transmitter or Ultrasonic Wind Sensor into a BACnet network. The IG04 provides an automated direct conversion from the Vaisala NMEA protocol to BACnet, in conjunction with the Vaisala Weather Transmitter or Ultrasonic Wind Sensor. The IG04 can be configured as BACnet/IP or BACnet MS/TP. Incorporates a web page interface for setup and commissioning (HTML and JAVA). No configuration software is required. Features web based configuration/commissioning screens. Removes the need for extra commissioning software. View the IG04 BACnet Gateway product page for full product specifications.